In the South, Fall is the best time to enjoy your screen porch, mainly because, June through August; it’s just too darn hot to sit out there! In summer, the only time I spent on my screen porch was in the very early morning, when I sometimes had my coffee out there –other than that –not so much. But now that the weather has moderated some, I am more than ready to perch on my porch. Because we have a view of the porch from both our breakfast and family rooms, I have always made an effort to decorate it just like another room in the house. And while I think it has always looked attractive, it wasn’t particularly comfortable. The main reason for this situation was that we didn’t have a full sized sofa that you could stretch out on. The furniture on my screen porch consisted of a Martha Stewart wicker set of two armchairs, a love seat and a small coffee table that I bought from Kmart about 20 years ago. I filled out the rest of the seating arrangement with two wrought iron chairs, a small wooden tobacco table that had belonged to my grandfather, and a baker’s rack that used to live in the kitchen of my old house. 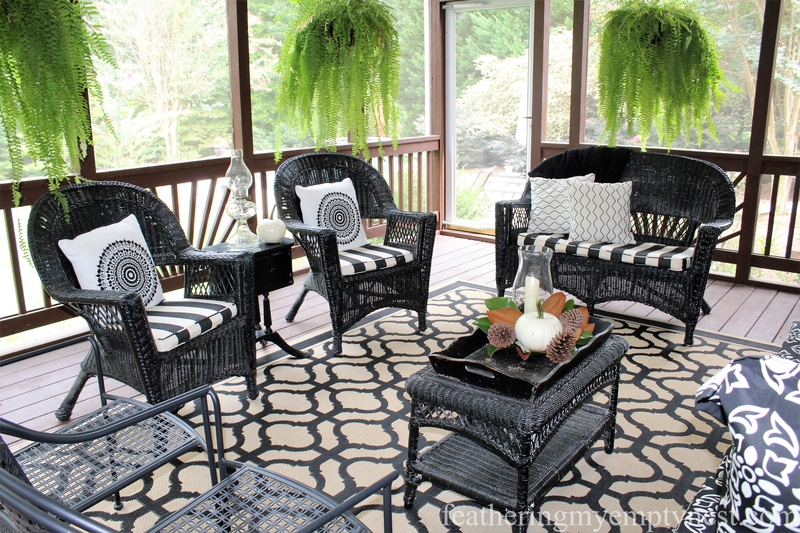 I painted the previously white wicker pieces black to coordinate with all of the black in my interior decor. I’ve wanted a sofa for the screen porch for forever, but if you’ve ever priced an outdoor sofa, you know that they are ridiculously expensive. However, earlier this year, when I was Pinteresting, I came across this good looking DIY outdoor sofa from Honeybear Lane. 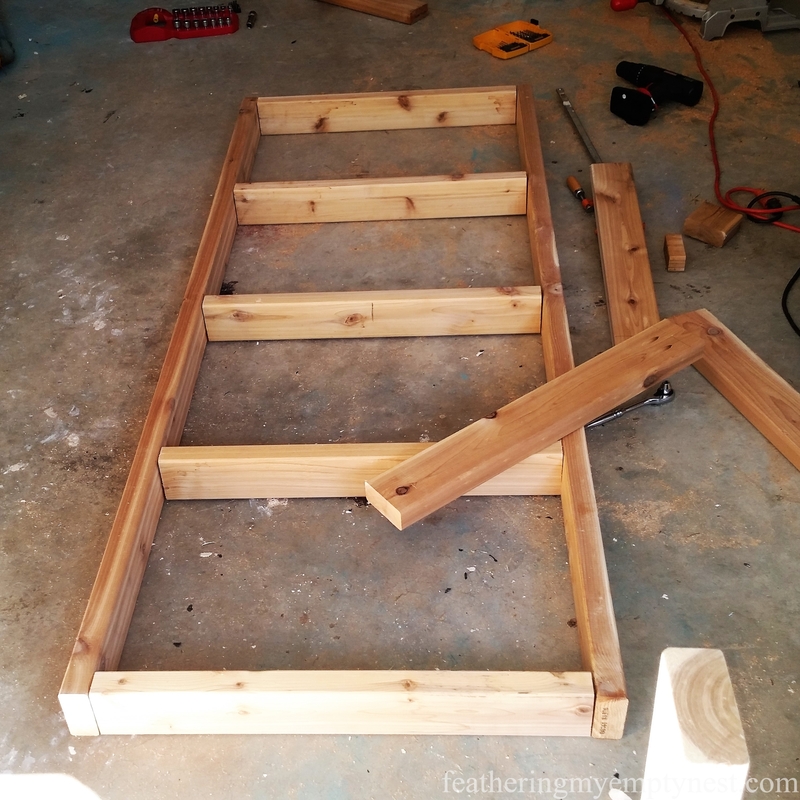 In her excellent and easy to follow step by step tutorial, Heidi, the author of the blog, claimed that the couch was inexpensive and easy to make, even for the terminally unhandy. I immediately pinned it and bided my time while I tried to figure out how to sweet talk my husband into making it for me. What, you thought I was going to make it myself? No way! 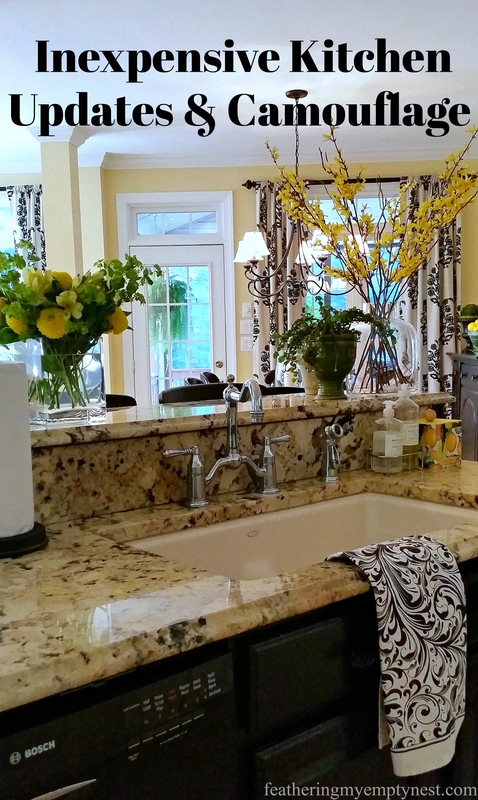 I have learned from a lifetime of DIY projects that once you establish your competency in any area, you become the go-to-girl for those kinds of projects. I am already on the hook for wallpaper removal, painting, furniture refinishing, sewing pillows and draperies, and many other similar tasks. I was not going to add woodworking to my list of so-called trades. As it turned out, my husband was intrigued by the challenge of building the sofa, so no bribery or blackmail was required. He said he would make it for me if I got him the lumber and agreed to paint it once he put it together. It took my husband and youngest child (who got conscripted to help him) a weekend to construct the sofa. According to my husband, it really was quite easy. But I did notice that there was a lot of back and forthing to the Home Depot in search of the proper screws and drill bits. The total lumber cost was around $180.00 ( we purchased select knotty kiln-dried cedar which is not as expensive as the clear grade cedar). I’d advise you choose the best lumber for the project that you can afford as warped or checked wood is harder to work with. The base of the seat deck in process. Once the base is screwed together, construct the arms (which also serve as the legs). In her tutorial, Heidi used a gray Rustoleum stain on her sofa, but staining requires a sealer, and since we didn’t spring for the highest grade of cedar, I decided to use Black Satin Rustoleum spray paint so that I wouldn’t have to take the additional step of applying a sealant. 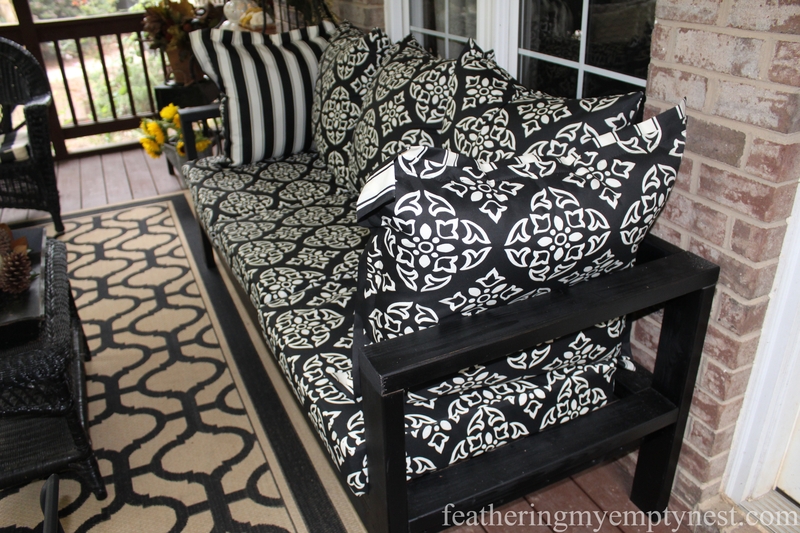 Completed painted outdoor sofa. Notice the vertical back slats we added to the project. Also, note the placement of the adhesive velcro on the seat which helps to keep the cushions in place. Remember the old adage about measuring twice and cutting once. To make sure that all the pieces that are supposed to be the same size actually are the same size, measure and cut one piece and then use that one to measure all the others. Lumber is expensive, and if you cut something too short, you will end up with a tiny sofa that is only fit for Barbie’s dream house. This plan requires screws with non-standard heads. So, make sure that you have the proper drill bits that are compatible with the screws. In the tutorial, the board on the back of the sofa is attached so that it’s horizontal to the floor — we attached it so that it’s vertical to the floor to provide more support for the pillows. We also added vertical support slats to the back of the sofa because we were concerned that the pillows would get pushed through when people leaned against of the back of the couch. The tutorial only uses the pocket jig to attach the slat across the back of the sofa; we also used the pocket jig to attach the arms to reduce the number of visible screws. The pocket jig was also the best way to attach the vertical slats to the back of the sofa. If we had thought of it earlier, we would also have used the pocket jig to attach the slats that support the seat as well. The outdoor pillows slide around, so it is essential to secure them with adhesive Velcro strips. 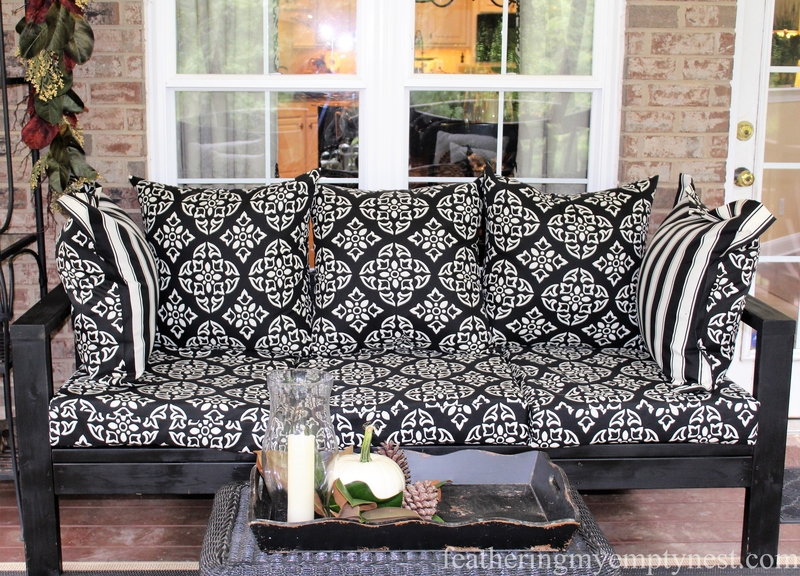 For my sofa, I purchased the type of outdoor cushions that Heidi recommended in her tutorial. 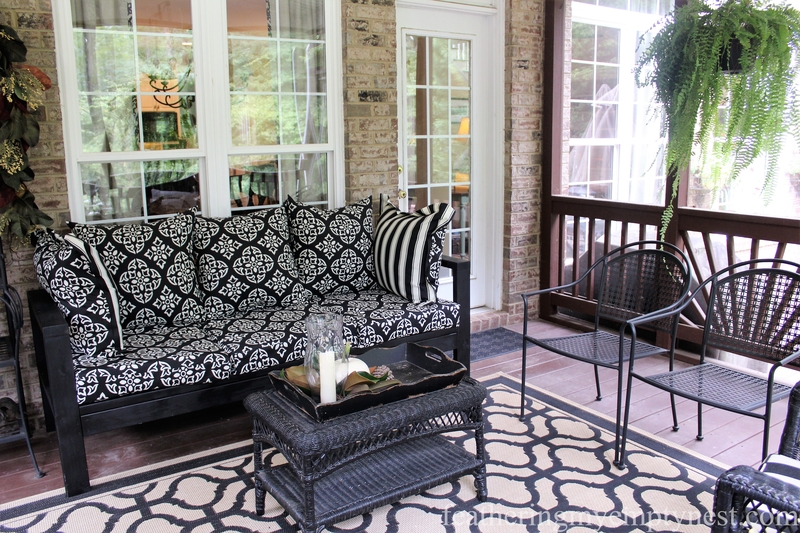 However, I chose mine in a black and white medallion pattern to coordinate with the black and white Sunbrella striped cushions I had purchased for my wicker furniture several years ago. In addition to the three sets of pillows and cushions, needed for the sofa, I added two coordinating striped flanged pillows to provide comfort and support when people are reclining against the arms. All of these are great because they are made to get wet and dry very quickly. I like the clean look of the arms on this sofa, but I might have added vertical slats to the arms, as we did on the back, to help support the cushions when you lean against them. The newly created full-size sofa adds much needed extra seating and a place to comfortably stretch out on my screen porch. I am very pleased with how the sofa turned out. And now that I know that my husband is handier than I thought, I am sure I can come up with a few other projects for my go-to guy to tackle. See what I mean about the inadvisability of demonstrating competency in certain areas? Looks fantastic! And pretty easy to make with the right materials– but nobody has to know that…just saying you built a sofa without any qualifiers sounds super impressive–which is a nice bonus! Thanks so much. Well, actually my husband and kid made the sofa but I did paint and style it! you and your HB did a nice Job your porch loo so nice . Thank you so much for your kind comment about our DIY Outdoor Sofa. I agree with you that the pillows from Walmart are great. We are really enjoying them. Happy Fall to you as well! Love the cushions you used. I’m following you on facebook. Can’t wait to see more of your (and your husbands) projects. Thank you so much. I really appreciate you taking the time to comment and for following me on FB! Your porch is beautiful Lisa and that sofa looks amazing. I love the idea of adding the vertical slats to the back. The last think you want when you’re sitting back relaxing is to fall through. Thanks, Michelle. The sofa was a surprisingly easy project. The original plan looked great but it really was much more practical to add the vertical slats to the back. Thanks so much for taking the time to comment. I really appreciate it! WOW looks great!! Your outdoor couch looks amazing. I love the black and white ! 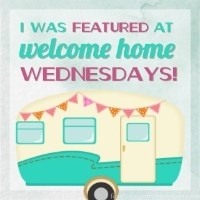 Saw your post from Amaze me monday link party! pinned! 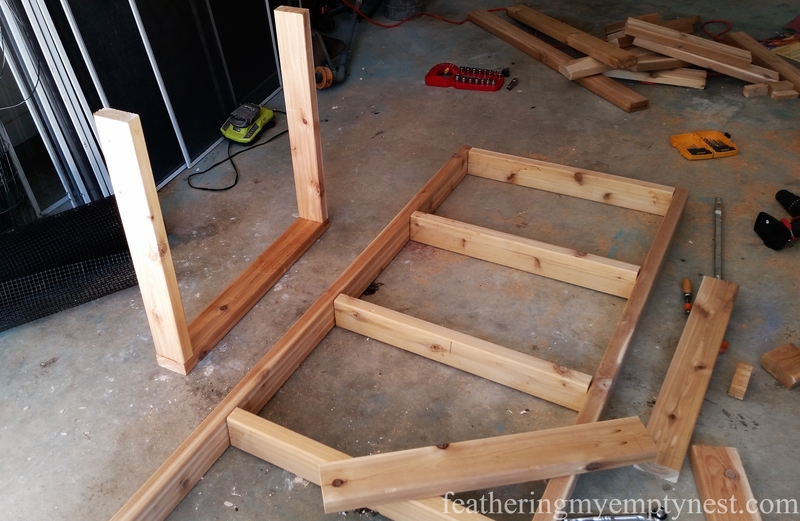 I may try this at one point…..oh I mean politely ask my woodworking hubby to add it to our diy list! ha. Thanks so much for your kind comment. It’s a great project and if you can get someone else to build it for you, so much the better! Wow…it’s beautiful! Your hubby did a great job and I do love the cushions! Thanks so much Cindy. I am proud of my husband. I had no idea how handy was! 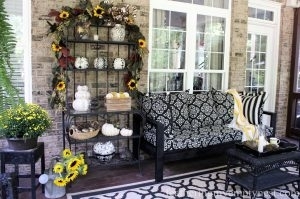 HI LISA—YOUR DAD AND CATHY WERRE AT MY HOUSE YESTERDAY AND I HAVE ALOT OF BUFFALOCHECK AND BLACK GINGHAM IN WITH MY FALL DECOR—CATHY SENT ME THE LINK TO YOUR BLOG. I LOVE EVERTTHING YOU DID ON THE PORCH–ITS STUNNING!!! I THINK I WILL BE A FOLLOWER FOR SURE!! Thanks so much, Barb. I am glad you enjoyed my post and I am delighted that you are interested in following my blog. 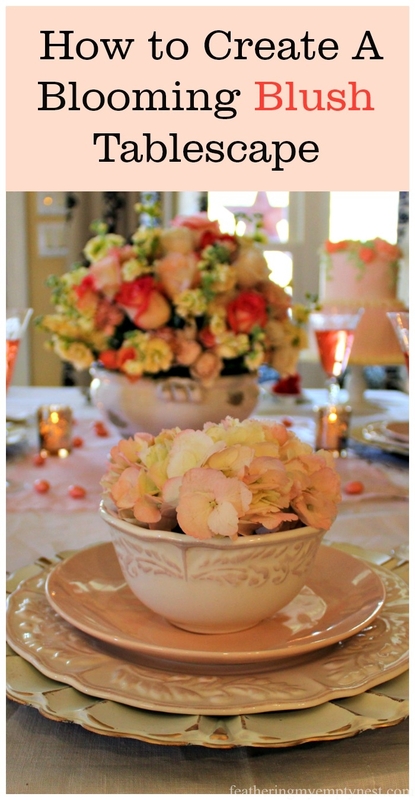 I have been taking a small break from blogging this fall, but I will be posting a Thanksgiving tablescape soon that you may be interested in.